R/T transportation from OKC to A2A races. **Attention**Riders need to sign up by Wed. 3/27, 5pm so your packets can be pulled and delivered to the bus. After then you will have to make your own arrangements to get your packet. Cost: $22.00 pp, no fees, nonrefundable but transferable. Bus Amenities: Restroom, reclining seats, reading lights,overhead and under coach storage. Passenger Pickup: Buses will make passenger pickups in both the Oklahoma City area Capitol South Pkg. lot, and at the OK Runner in Norman the morning of the run. OKC 5:00 a.m. load bus, leave no later than 5:05, Norman pickup time approximately 5:30 a.m. The bus will deliver runners to the starting line for each race. Clean-up after the run: Showers and dressing rooms will be open at the Ardmore Noble Stadium for clean up prior to the return trip. Bring your own soap & towel. Return to OKC area: Bus will leave the Ardmore area for return to OKC at approximately 12:30pm. Be sure you can complete race/be on bus by this time. 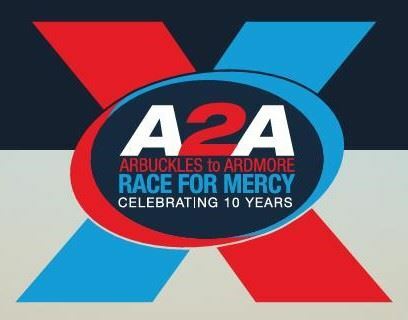 Bus Rider race packets will be delivered to those riding the bus.... no need to drive to Ardmore the day before! 26.2, 20.6, and 13.1 runners be sure to bring throw away clothes as you may not have a bus to stay warm in at the starting line since the 5k starts at 8am also. The bus will drop you and head to the next starting line! 5K runners may be riding the bus to the start or a volunteer will take you. Halfers may get to stay at the half start line w/bus. Bus will depart Ardmore at 12:30pm or sooner. Therefore, marathoners and 20.6 milers you should be comfortable running a 4:30 marathon or 20.6! Since the majority of riders will be running the half marathon, we ask any rider running the marathon (26.2) or 20.6 to be finished and ready to leave no later than 12:30pm or make other plans. We will leave earlier if all riders are finished and ready to go.